Credit.com offers users free Experian credit scores, a credit report card, and relevant articles from knowledgeable experts. If you’re looking to learn about your credit and how to improve it, the site can be helpful. The site earns money by selling additional credit scores and other credit information and by partnering with advertisers and affiliates that pay Credit.com for referrals. The site also sells credit monitoring services and identity theft protection services. Two main features of the site are the free credit score and a Credit.com report card, neither of which requires the use of a credit card to obtain. Both the Experian score and the report card are updated every 14 days, and the report card can tell you if there is anything holding down your credit score. For example, if you owe a lot relative to your credit limit, your scores will suffer, and the report card will highlight this red flag. Credit.com is probably most valuable for the education you can get by reading articles. You can learn how your credit works, how to improve it, and which products to use as you borrow. You can also submit questions, which might be answered in future articles. One of the links on Credit.com provides information about credit repair provided by Lexington Law. This is really an advertisement and an example of one of the ways Credit.com makes money despite offering free scores and advice. The most important thing to understand about credit repair is that there are no quick fixes. The services offered by Lexington Law center mostly around helping clients fix errors on their credit reports and on providing advice and strategies for improving credit. If you find errors on your credit report, a service like the one offered by Lexington Law may be worth considering. There's nothing unique about the services being offered through Credit.com. 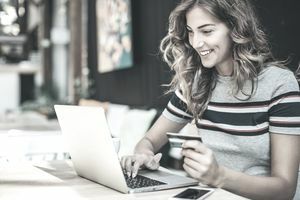 It's become increasingly common for banks, credit unions, and credit card issuers to provide customers with free credit scores and detailed information about their credit. If you aren't already receiving these services, it's worth inquiring with your bank, credit union, or credit card issuer to find out what's available. If they don't offer anything, it might be worth shopping around. Additionally, online services like Mint.com, CreditKarma.com, and others offer services similar to Credit.com. You can obtain free credit scores from these services in addition to insight into your credit. It can be worth it to use multiple services because each one provides information from different credit reporting agencies. Both Mint.com and CreditKarma.com, for example, provide TransUnion scores, as opposed to the Experian scores Credit.com provides. All U.S. consumers are entitled to get a free credit report once per year from each of the three major credit reporting agencies, which includes Equifax in addition to Experian and TransUnion. To get your credit reports, visit AnnualCreditReport.com. The free reports do not include scores, but if you subscribe to Credit.com and other sites, you should be getting those scores for free already. Sometimes, it's a good strategy to get a different report every four months as opposed to getting all three at once. Each agency can have slightly different information, but if there is a major issue with your credit, it's unlikely to slip past one of the agencies. You Can't Borrow From an IRA, So What Can You Do?